Are you watching the Tour de France? One of the most remarkable elements in the race is the peloton. Cyclists ride in tight packs to save energy by drafting (up to a 40 percent reduction in drag in a well-formed peloton), but there are many more advantages of the peloton, including the encouragement from other riders and the teamwork involved. I enjoy cycling in a group: riding together, taking turns at the front, talking about life as we roll along, and helping one another when bikes or bodies break down. There is a sense of community on these rides. Authentic community is an indicator of a healthy small group that I discuss in my book Small Group Vital Signs. Your group cannot be healthy and growing if you are not living in authentic, biblical community. Become a Group. Before you can build teamwork, you need to know one another. A great cycling team, as in any sport, spends time together, getting to know one another personally. It’s really good to know the tendencies of the people I ride with. Same goes with small group members. Develop Bonds of Trust. In the peloton or even a paceline, you must trust the riders in front of and around you. If a rider in front of you just touches his or her brakes, it can cause many riders to crash. In a small group, you must develop a trust among one another. For one, discuss the vitality of confidentiality. Group members must be able to trust others in the group for authenticity to take hold. To go along with this one, a great cycling team and small group develops a commitment to one another and to their shared goals as a team. Trust and commitment go together like a chain and cogs. Become a Team. Each cycling team member has his or her own unique strengths and weaknesses. Some are sprinters, some are climbers, and some are “domestiques,” that is, cyclists whose role is to support and work for other riders. It’s important for your group members to know what gifts and talents they bring to the group–for the good of the group. Every single group member should have a role. Develop the Team. Your work is not finished once you form a team. Cycling teams spend lots of time on the road practicing for all kinds of different situations during events. 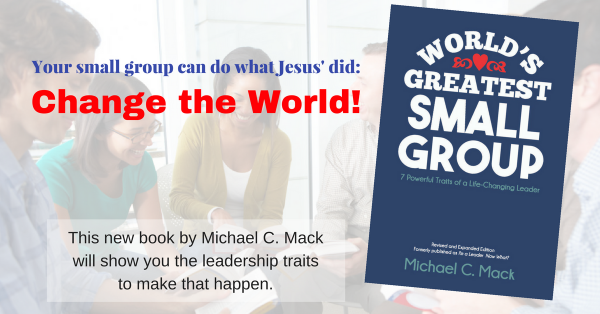 As your small group works together using your individual gifts and roles, both during group meetings and as you serve others together, your teamwork will become stronger and stronger. But you must get out of your comfort zones to make this happen! Share Leadership. In a paceline, each rider takes turns up front. This is a way of serving the team, and it is often hard work. But everyone takes a turn, giving the others some time to recover for their next time up front. (A leech is a rider who takes advantage of the draft from other riders but never takes a turn up front. Be sure you don’t have any leeches in your group!) Now here’s the really cool part. In a good paceline, the front rider actually gets a small help from the riders behind him or her. Somehow, and I don’t quite understand the science behind it, the slipstream provides a kind of “push” for the front rider. Sharing leadership with your group may be the best thing for the group you ever do! Confess and Speak the Truth in Love. Cycling team members must get really good at real, transparent communication with one another. They know that to get better as individuals and as a team, they must be able to say “my fault” or correct other riders. Learn how to care enough to confront sinful behavior in an environment of unconditional love and with God’s grace. If you can’t speak the truth in love (and with the person’s best interest at heart) then you’re not ready to speak. Keep praying. Have Fun Together! Riding with a finely tuned team is lots of fun. You go faster and can ride farther together. Healthy, genuine community should be exciting and fun! Laughing together builds friendships and can even build trust and set the stage for deeper discussions.